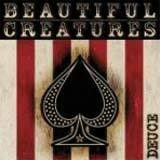 Deuce is the second album from LA rockers Beautiful Creatures. The band was formed by ex- Bang Tango frontman Joe LeSte, who also handles vocal duties for this band. It’s been four years since the band’s debut album was released. Despite numerous lineup changes, the band has persevered and now released its sophomore album. The members of this band are well seasoned musicians who were part of the testosterone drive hard rock explosion of the 1980’s. That shows in the band’s songwriting, but I do think some elements of the band’s sound are a detriment. As I said above, the band members know how to put together catchy, hard rocking songs. They are well traveled veterans of the hard rock scene, so musicianship, riff based songs, and memorable songs are what these guys do best. For the most part, Joe LeSte’s vocal performance is powerful and charismatic, very much a perfect fit for the music at hand. Of the thirteen tracks on this album, half to two thirds of them sound like classic 80’s hard rock with contemporary production. Actually, the album cruises along with just a few bumps along the way until the ninth track, an instrumental entitled The Unknown. From that point onward, the album declines pretty fast. Still, of the first 8 tracks of the album, the band displays some very good hard rock moments. Up until Straight to Hell (the album’s strongest track), the band delivers guitar driven hard rock with plenty of catchy moments. Unfortunately, I do think the guitars are too “safe” in their approach. Joe LeSte sings with intensity that far outpaces the guitar work the majority of the album. The riffs are solid and well played, but they don’t have nearly enough attitude or intensity to match LeSte’s vocals. I get the impression that the band wanted to keep this album somewhat accessible for potential radio play instead of really letting loose. The use of down tuned guitars also leads me to believe that the band is very interested in attracting fans from the modern rock crowd. However, there are plenty of lively solos that hearken back to the glory days of hard rock, one of the saving graces for this album. Straight to Hell is easily the most heart pounding affair of the disc, it’s too bad that the band didn’t aim their sites for this type of sound more than once. Songs like the opener Anyone, Freedom, and Unforgiven could easily find their way to modern rock radio alongside bands such as Velvet Revolver and Brides of Destruction. However, the general restraint and lack of bite in their music will certainly hurt the staying power of the music, at least for me. Aside from the grungy Empty and techno-ish vocal affects found in Superfly, which sound unnatural for the band, tracks one through eight are basically classic 80’s style hard rock with modern production. After the instrumental The Unknown, Beautiful Creatures unloads Ton of Lead upon us, a much too blatant copy-paste job of Soundgarden. LeSte even tries to sing just like Chris Cornell. In this case, I just can’t stand the band trying so hard to sound like someone they’re not. Brand New Day sounds like a B-side from The Cult’s latest album, Beyond Good & Evil. Again, such a blatant rip off is something that I just can’t get into. LeSte even does his best to imitate Ian Astbury in this instance. I really can’t understand what the deal is with trying to disguise themselves as another band for these two tracks. A heavy rocker, Thanks, follows up these two “cover” tracks. Along with Straight to Hell, this is one of the heavier tracks on the album. I don’t feel that LeSte’s vocal performance is as strong as the aforementioned, but it one of the highlights of the album. The album closes with a forgettable, “unplugged” modern rock ballad, I Won’t be the One. While there are some cool moments to be found on Deuce, there aren’t enough to keep this album from getting buried beneath the sheer number of strong hard rock releases (mostly European) for me. I think this band would really stir the pot if they just let loose and pounded our skulls with heavy and aggressive guitars. The band shows brief flashes of this on Deuce, and I for one like it. Of course, I’d also like to see the band avoid trying to sound like other bands, and just worry about sounding like Beautiful Creatures.